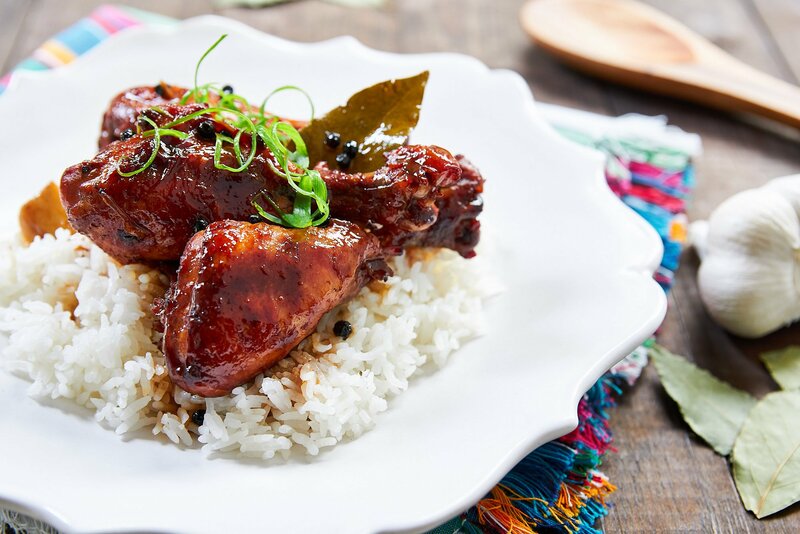 The unofficial national dish of the Philippines, Adobo is made by marinating and then braising meat in vinegar and soy sauce, seasoned with spices such as garlic, bay leaves and black pepper. By the time it's done the chicken falls-off-the-bone and is coated with an immensely flavorful sauce that's rich and savory with a balancing tang. As much I love making chicken adobo at home, I’ve somehow managed to skip doing an adobo recipe on this blog. I hadn’t thought much about it until I started getting requests to do more Filipino recipes. I guess it never occurred to me to write about my way of making adobo because it’s always been such a “no recipe” dish for me; just thrown together without much thought. 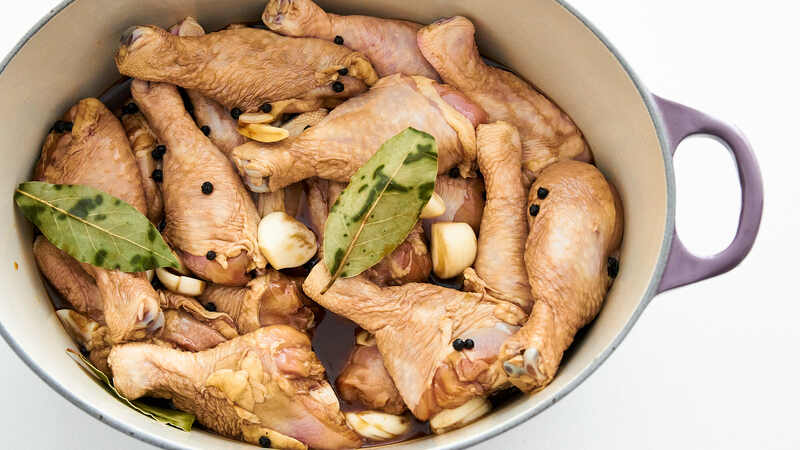 The other reason is that like most of the best foods in the world, there are about as many ways to make adobo as there are cooks who prepare it. With over 2000 inhabited islands, and a population comprised of 175 ethnicities, speaking 182 languages, the Philippines is one of the most diverse countries in Asia, and it’s no surprise that this can lead to a lot of friendly disagreement about the right way to make a dish. Before I get into my version of Chicken Adobo, let’s clear the air and say there is no single “right” way to make this dish, so please don’t leave comments telling me I’m doing it wrong. 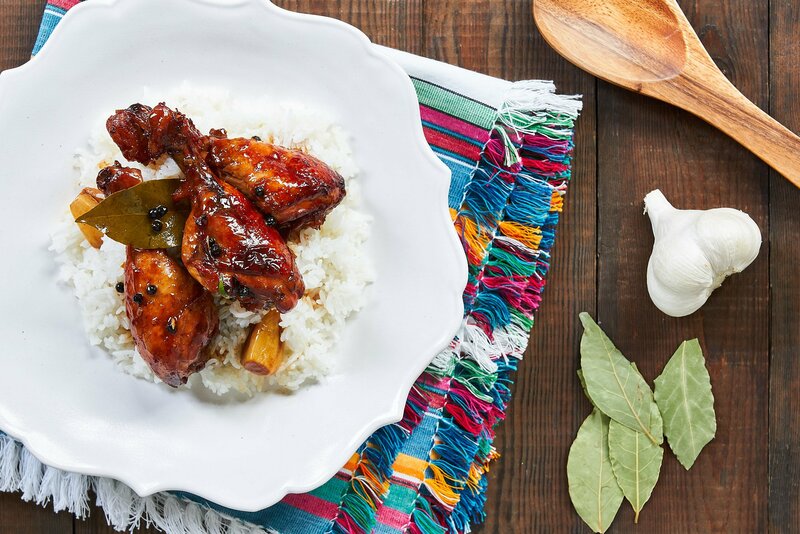 I would, however, love to hear all the different ways you make adobo in your home! Now that that’s out of the way, here’s how I came up with this recipe. Like I mentioned earlier, I usually do chicken adobo without a recipe. That is to say that every time I make this, it’s a bit different. Sometimes I add onions and potatoes, other times I add coconut milk. That being said, I wanted to leave the controversial ingredients out, and do a very basic chicken adobo that focuses on the technique. 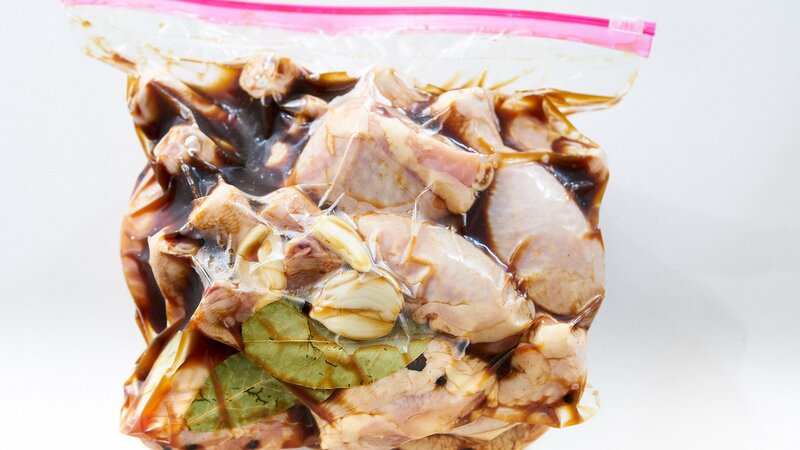 I started by marinating chicken drumsticks in garlic, black pepper, bay leaves, soy sauce and coconut vinegar. 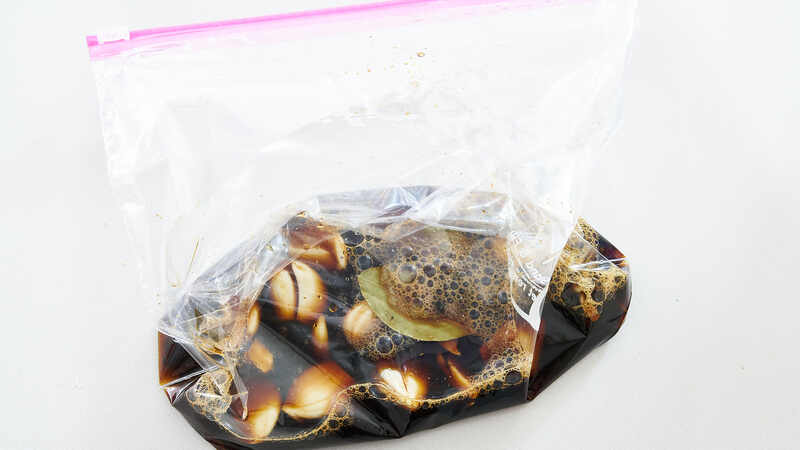 I like using a 3:2 ratio of vinegar to soy sauce, which provides the pronounced tang of the vinegar, while imparting enough salt and umami from the soy sauce to give the dish plenty of flavor. I also like to add just a bit of coconut sugar to the sauce to help balance out the puckeringly tart vinegar and salty soy sauce. It’s not enough to make the dish taste sweet, but smooths over some of the harsh edges, resulting in a well-rounded taste. 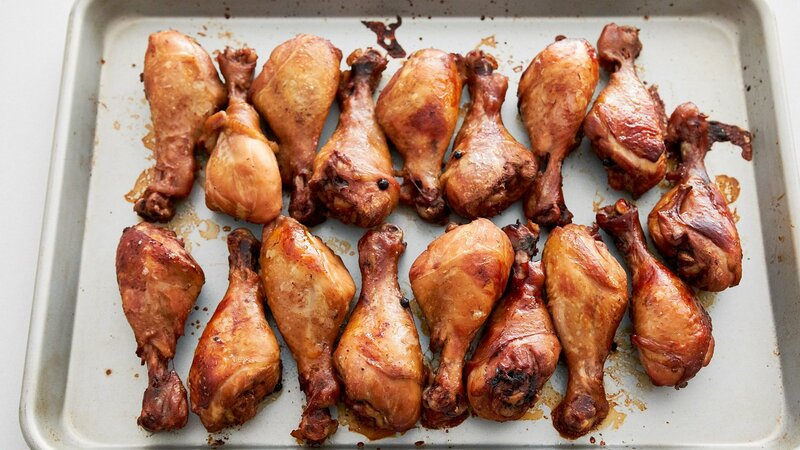 For the chicken, I like using drumsticks because the slow-and-low braising time in the oven breaks down the ample connective tissues in the legs. This enriches the sauce with collagen, while making the meat so tender you could eat it without teeth. Chicken thighs will work as well, but please don’t make this with chicken breast, unless you like eating damp cardboard. Once the chicken has had a chance to marinate overnight, I just dump the contents of the bag into a large dutch oven, cover it, and braise it in the oven at 280 degrees F for about 2 hours. By the time it’s done, the skin should be so delicate it’s no more than a lubricating layer before you hit the meat, which pulls away from the bone without much coaxing. I could have stopped here and served this over a mound of steamy hot rice, but not one to leave well enough alone, I took one further step that makes all the difference. I transferred the chicken to a sheet pan to blast it for a few minutes in a high-temperature oven while reducing the adobo sauce on the stove. 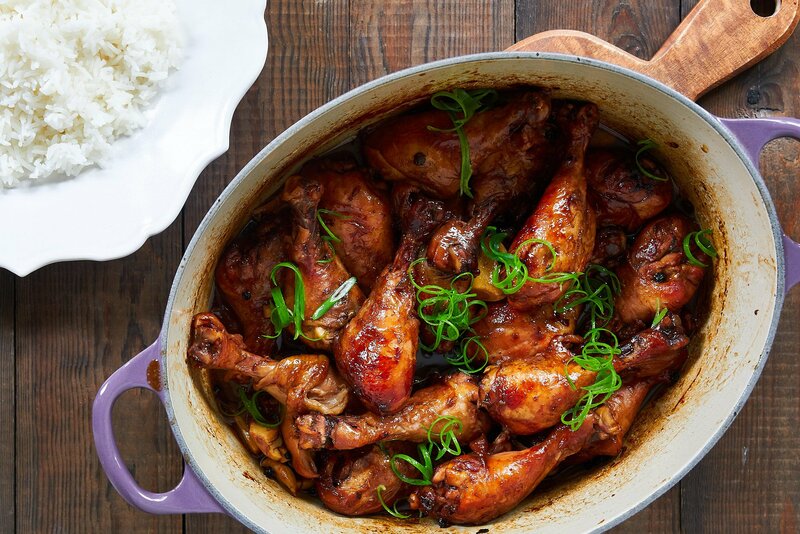 The broiling caramelizes the skin, giving it a stunning auburn hue, while the sauce thickens into a rich gravy-like emulsion that’s able to cling to the chicken when you toss it back into the sauce. Served on a mound of piping hot rice, draped in a generous ladleful of sauce, I can think of few foods as flavorful and comforting. 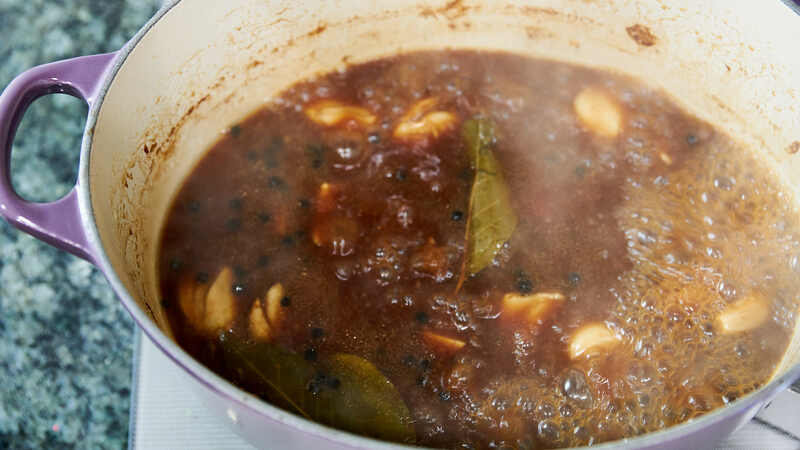 Add the bay leaves, garlic, black peppercorns, coconut vinegar, soy sauce and coconut sugar in a resealable freezer bag and then shake to combine. Add the chicken and seal the bag, pressing out as much air as you can. Let the chicken marinate overnight, mixing it around a few times if you can. 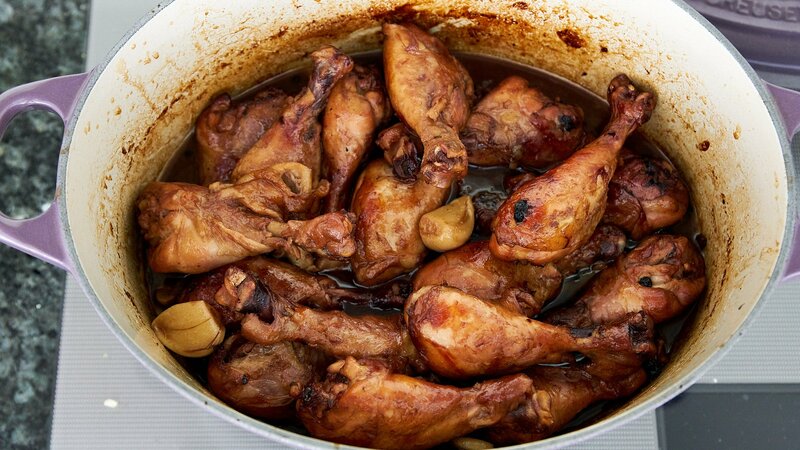 When you're ready to make the chicken adobo, pre-heat the oven to 280 degrees F (140 C). Open up the bag and add its contents to a heavy bottomed pot with a lid (like a dutch oven). Close the lid and put the pot in the oven for 45 minutes. Remove the chicken from the oven and rearrange so that the chicken on top goes to the bottom. Braise in the oven for another 45 minutes or until the chicken is very tender. When the chicken is done, remove it from the oven and turn the oven up to 450 degrees F (230 C). Transfer the chicken to an oiled non-stick sheet pan and put it in the oven to caramelize until auburn brown (about 5 minutes). Meanwhile, boil the sauce until it becomes thick enough to coat the back of a spoon. 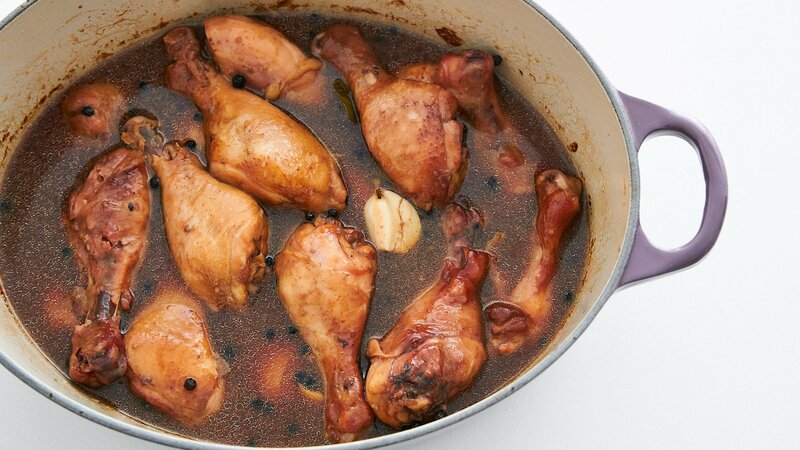 When the chicken is done, put it back in the pot and toss to coat with the adobo sauce. 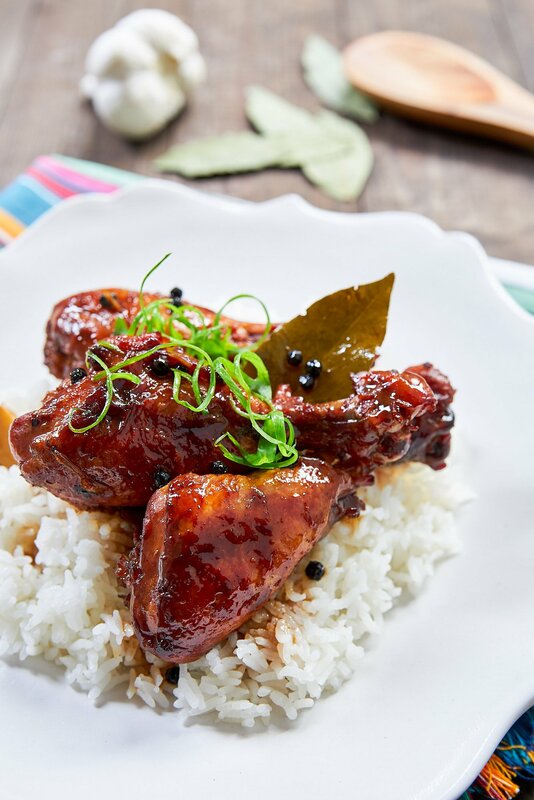 Serve your chicken adobo garnished with scallions on a bed of hot white rice. Hi- is it possible to use white vinegar for this? Hi Ikeasha, white vinegar will not have quite as much flavor, but it will work fine. Hi Marc! One of the ways we make adobo is by adding coconut milk to a chicken pork adobo. It gives a flavor to the dish and I add chicken liver. It’s one of my favorite ways to cook Adobo. Thanks for the suggestion Thea! I love how many variations of Adobo (and really any Filipino dish) there are, thanks to the country’s diverse population.